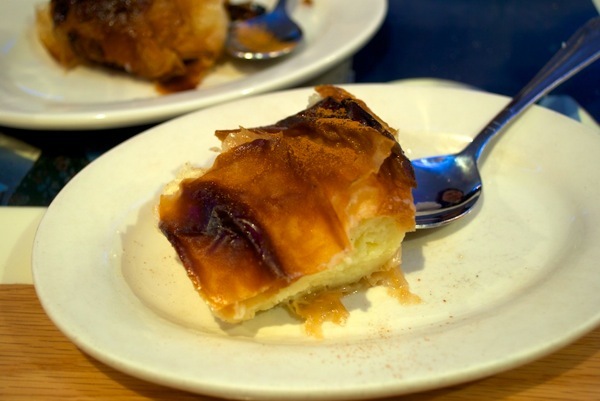 This is part one of a series of posts detailing the food I ate during an April 2011 trip to New York. 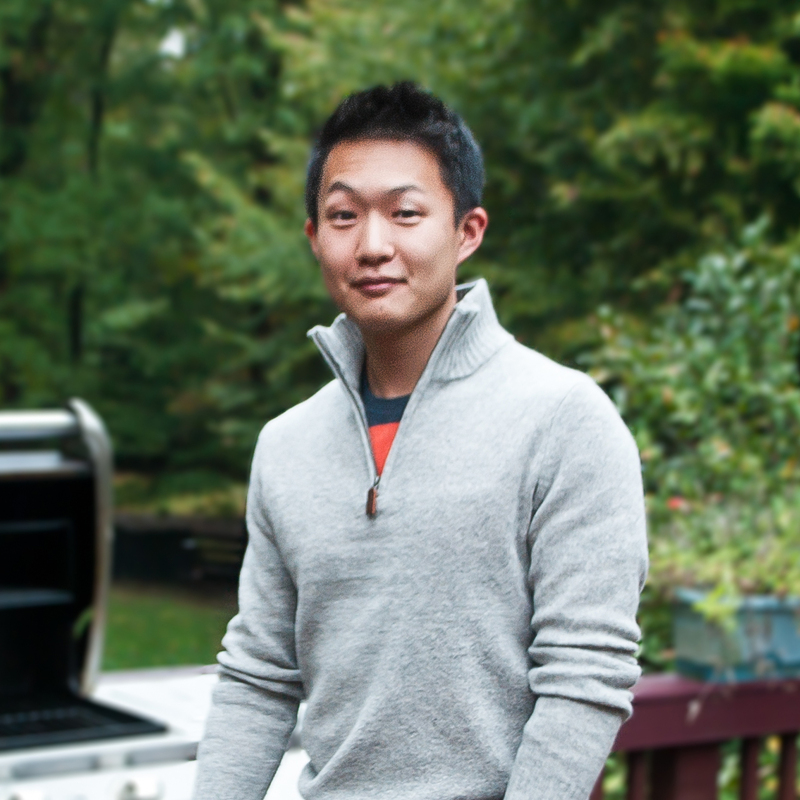 After visiting Yale for its pre-freshmen visiting days—Bulldog Days—I spent some time in New York exploring new restaurants, foods, and revisiting some old restaurants. At this point in life, I am nestled in that weird limbo of time between high school and college, when I am far away from the rigors of high school and oblivious of the chaotic times of college. Where does that leave me? In a place where I can truly sit down, relax, and enjoy life. Going to restaurants and cooking food takes on a whole new perspective, since I don’t have to worry about the tasks ahead of me, so when I visited Taverna Kyclades, I got to idle around and soak in the vibe of a lively neighborhood bistro. 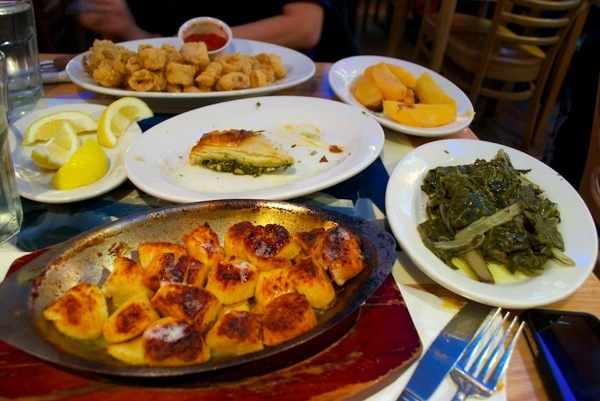 Taverna Kyclades specializes in simple, Mediterranean seafood with very little fancy sauces or seasonings. 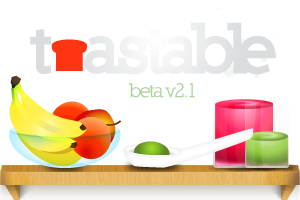 They rely on the quality of ingredients to create a wonderful gustatory experience, and that is why Kyclades manages to garner rave-worthy ratings. As a plus, Mediterranean food tends to be healthy because of its use of olive oil, lean meats, and vegetables. 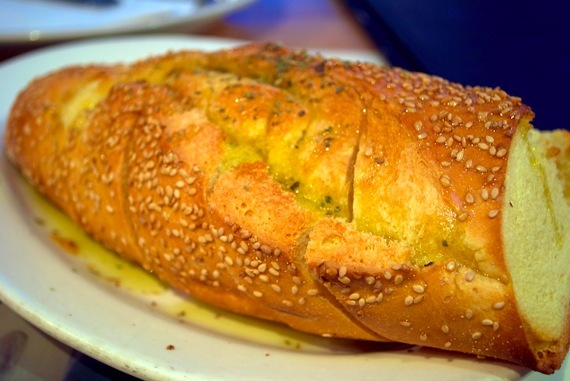 Like most restaurants, Kyclades serves a “bread basket” before the actual meal. The loaf, which came out warm and fluffy, was dressed in some olive oil and herbs. Kyclades’ loaf definitely was one of the better complimentary breads I’ve tasted. My mom and I ordered one appetizer, which was the spinach pie. 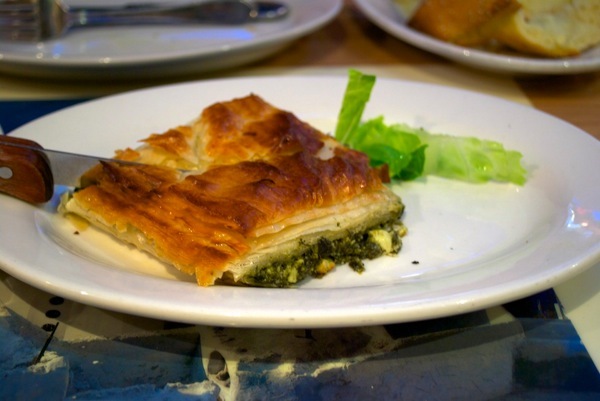 The spinach pie had a delicate, tissue-thin crust that was crunchy yet pliable. The stuffing consisted of lemony, herbaceous flavors that added complexity to the cheese. The pie tasted a bit salty but aroused my taste buds for the oncoming main dishes. 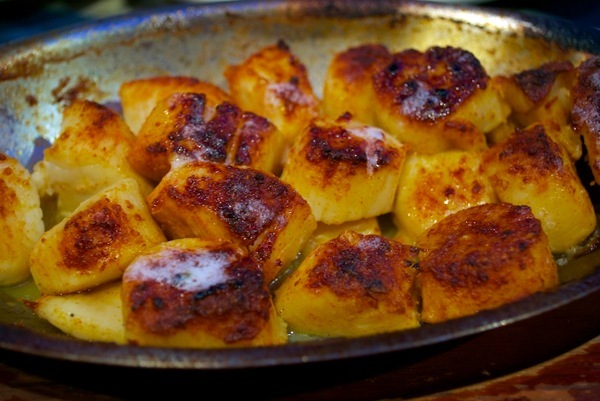 The lemon potatoes, which are actually a side dish, carried a tantalizing amount of salt which was detectable but not overwhelming. 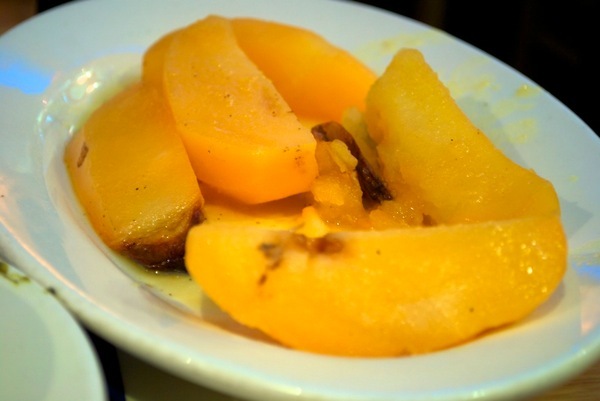 The zest of the lemon amplified the mild saltiness of the dish to create a surprisingly tasty yet simple dish. In addition, the potatoes did not feel dry and easily succumbed to the pressure of my mouth. 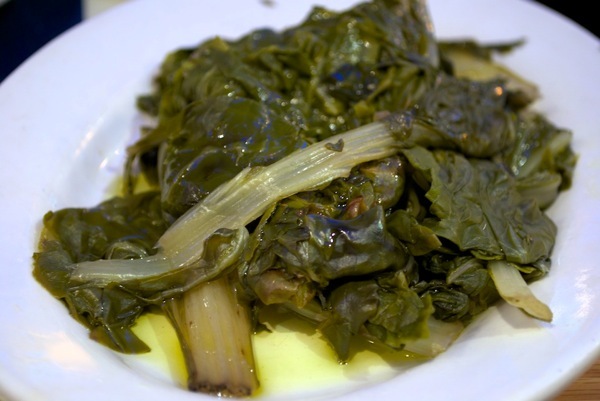 The other side dish consisted of some wilted greens bathing in olive oil. There was very little taste in these greens, especially when compared to the masterful lemon potato dish. My mom ordered the fried calamari, and again, the dish lacked fanciful spices or flavors. Fortunately, the mouth feel of the dish was superb. 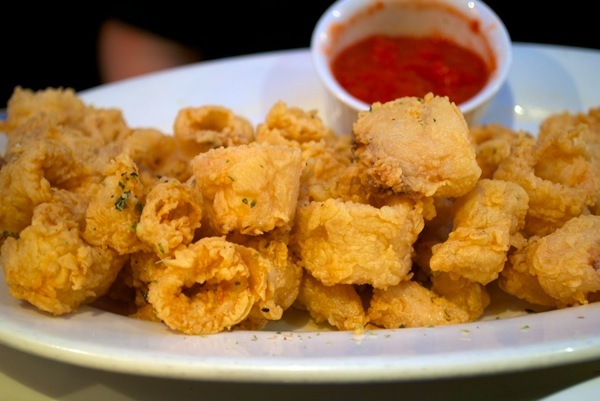 The breaded crust was crunchy and substantial, and the calamari felt like they were freshly picked from the ocean. My entrée, broiled scallops, also lacked salt and spices, but the portion was huge. The scallops sported a crunchy char and were cooked to perfection. My teeth sunk easily into the muscle as the succulent juices let out from the scallop. Finishing off the meal was a complimentary dessert that appeared to be some sort of rice pudding. Following Kyclades’ theme of simplicity, the pudding was only mildly sweet but sweet enough to satisfy the post-dinner dessert craving.